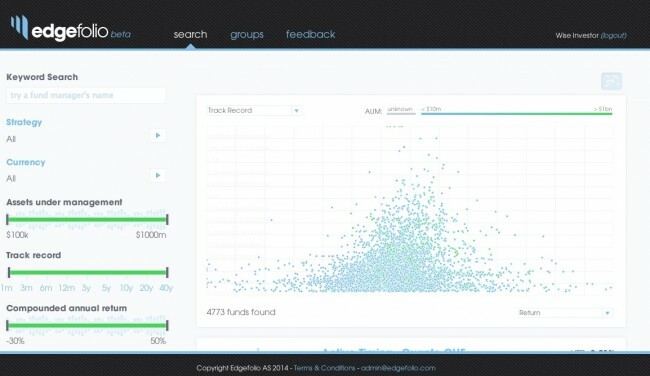 You are here: Home » Investors » Edgefolio: the new platform for the hedge fund industry. Edgefolio: the new platform for the hedge fund industry. Allocators have it rough. When they are not being bombarded by cold calls and unsolicited emails from hedge fund sales teams, they spend their time trying to find managers through multiple sources – such is the picture of the fragmented hedge fund industry of today. At Edgefolio, we thought it was time to reset the balance and re-enable allocators to do what they do best: find great hedge funds. What is Edgefolio? from Edgefolio on Vimeo. With an emphasis on user experience and beautiful visualisations, Edgefolio has positioned itself to be the most intuitive and powerful hedge fund screening tool on the web. At its core Edgefolio is a committed to protecting allocators’ anonymity, and empowering them with everything they need to start the conversation with interesting fund managers. Edgefolio is going to change the game. To see how, request an invitation to our platform here.